In the mood for some Japanese metal? 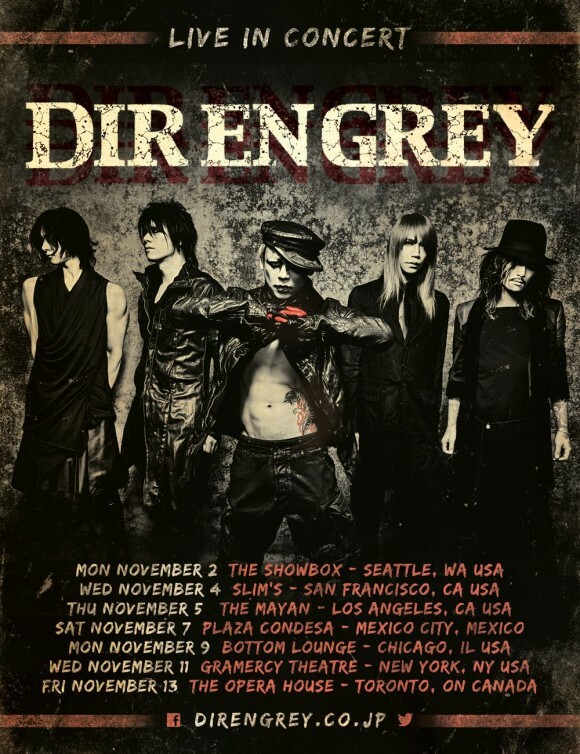 Then you’ll need to catch DIR EN GREY at the Showbox tomorrow, Monday, November 2nd! The band will bring the first date of their Never Free From the Awakening tour to Seattle, and it means it’s an evening with DIR EN GREY. No openers, no waiting, just what you want: DIR EN GREY! With a huge and beautiful sound mixing speed and melody, DIR EN GREY is also known for their cool live shows. While singing predominantly in Japanese, they also have songs in English. Either way the songs are accessible in their intensity and mood. All these things explain why DIR EN GREY has now been around for sixteen years, and perhaps why they’ve maintained their original lineup (this is very, very difficult for bands to do)! To celebrate their 15th anniversary, the band released Arche, DIR EN GREY album nine, which reached number 4 on Billboard Top World Albums’ charts. Excellent! And this witch ended up taking a couple days off around Halloween, so apologies there was no show alert for this show earlier. The Showbox has tickets and more details available on its DIR EN GREY event page. Written by: Dagmar on 11/01/2015. This entry was tagged DIR EN GREY, posted by dagmar. Bookmark the permalink.